This set is from those vending machines you see in shopping centres, where the toys are dispensed in little capsules. The company that produces them isn’t written on the base of the figures, but some Internet sleuthing told me that Tomy, TYC and Gacha are all involved… somehow. I couldn’t find details on who does what, as companies like these never really provide information on their back catalogue, and only focus on current products. Anyway, these figures are pretty highly detailed, especially considering how small they are. There are several sets of Simpsons capsule toys, and the ones I have are all of pretty good quality. 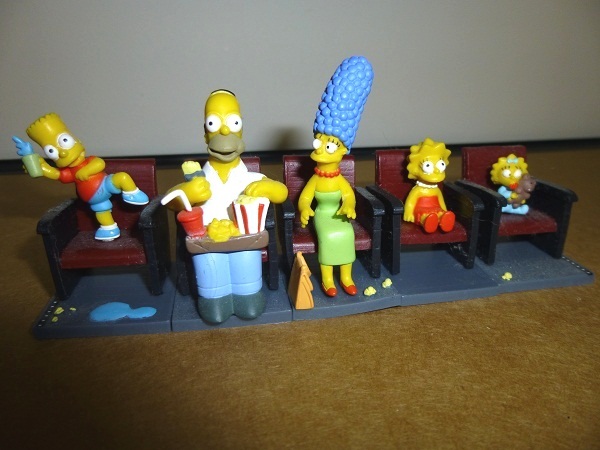 This one, featuring the family sitting in cinema seats, was released in 2007 as part of the big merchandise line promoting the release of The Simpsons Movie.